It’s been a few weeks since my last Snoqualmie knitalong post… I was hoping to be a little further along but ran into a few obstacles. I had an impossible time establishing the tubular cast-on for the left front and threw the project down in a snit after a week of stops and starts. I’ve learned when it’s time to take a break. Once you start the back, it’s just a lot of straight up cabling with nary an interruption for quite a long time;I found this very soothing and easy to do while watching tv. 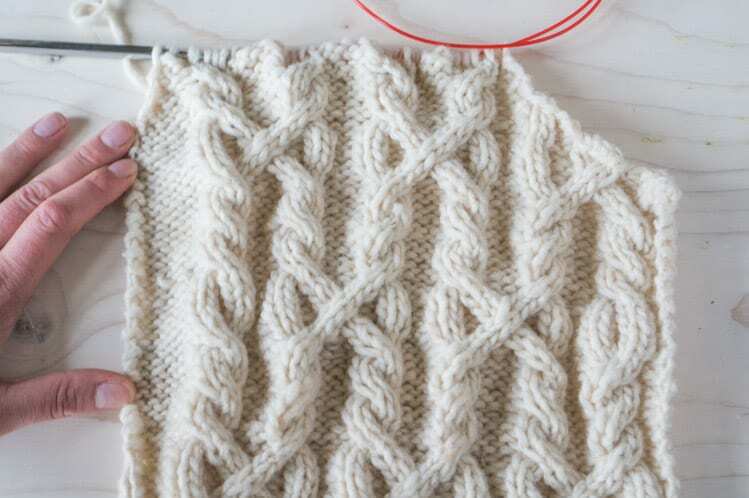 By the time I got to the armholes, I barely had to glance at my cabling chart since I began to intuitively know what stitch came next. I quickly abandoned my stitch counter and stitch markers as unnecessary, although I did run into some problems as I decreased for my armholes. 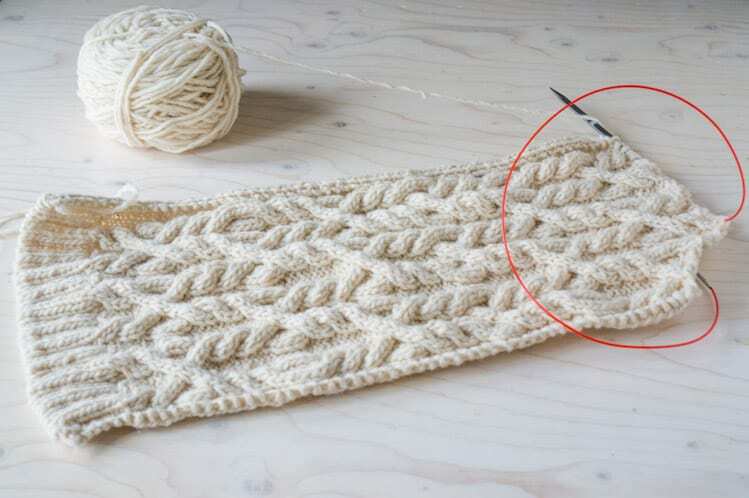 It seems that for size 45 3/4″, the stitch motif runs right along the armscye, to the point where the cable would be sort of half finished on the right side. 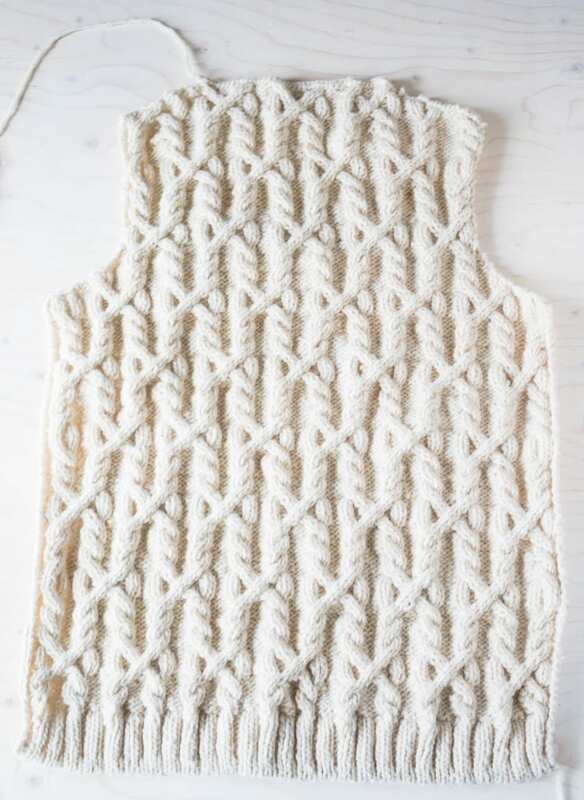 This didn’t make sense to me so I took to Ravelry, where of course some crafty knitter had come up with a solution. Thanks to a note from brittluvstoknit I decided to leave off two rounds of decreases, essentially leaving an extra two stitches on the needles. 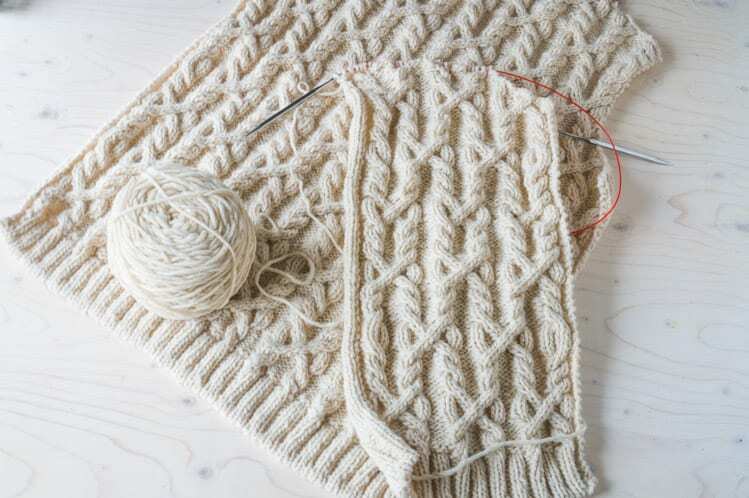 This let me run the full cables along the armhole, although even with omitted decreases, the cable on the right was one stitch narrower than the one on the left; I think you can barely tell in the finished work. 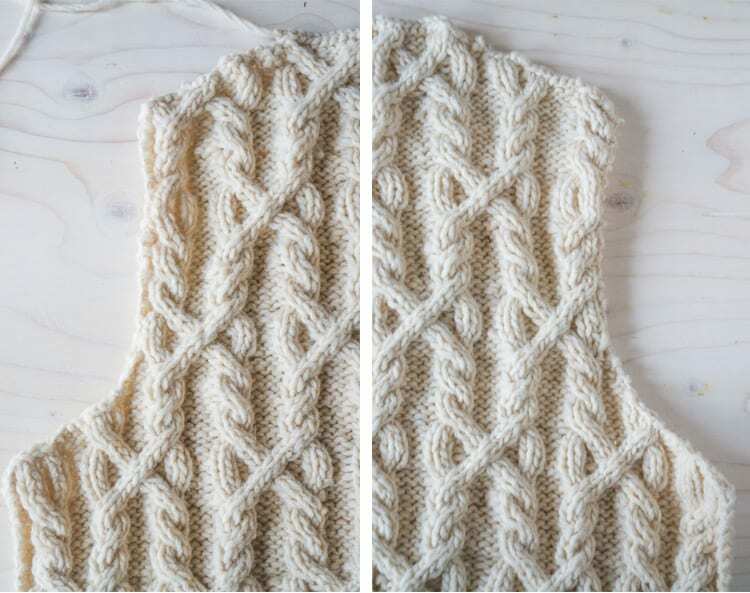 The shoulder will be slightly wider but I think it’s worth it to continue the cables uninterrupted. 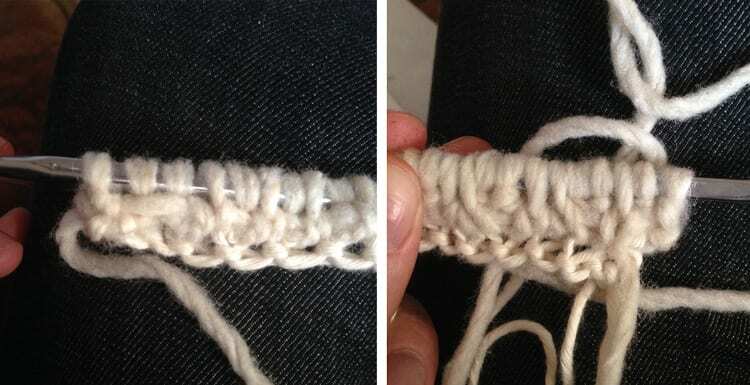 I’m quite fond of the sloped bind off technique, which essentially has you slipping the first stitch rather than knitting it. It creates a nice soft angle to the decreases. I deeply enjoyed how much faster the front took shape once I resolved my cast on issue. 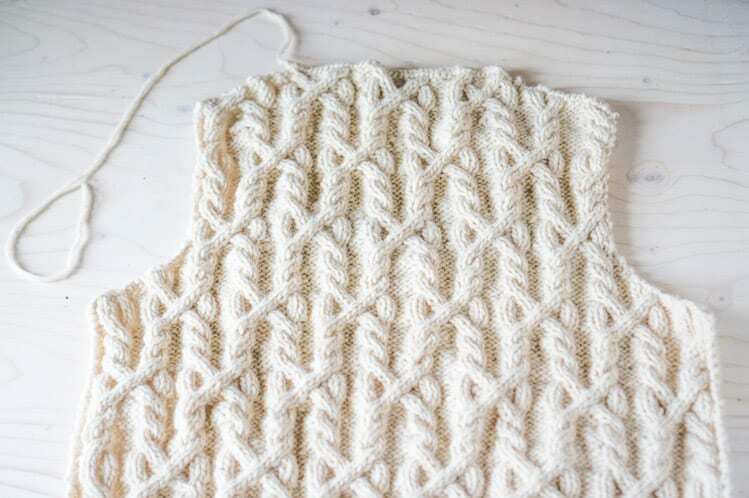 The only thing to really stay on top of with the front pieces is a) making sure I remove one decrease on each side so that my shoulders are the same width as the back and b) being mindful to decreases on both sides of the front to begin the neckline shaping. I’m almost done the left side and will be starting the right shortly; if all goes well I’ll be starting on the sleeves next week. This is the part I’m the most apprehensive about given all the shaping that will need to be done, but must say I’ve been pleasantly surprised by how manageable this sweater has been so far for a novice knitter. 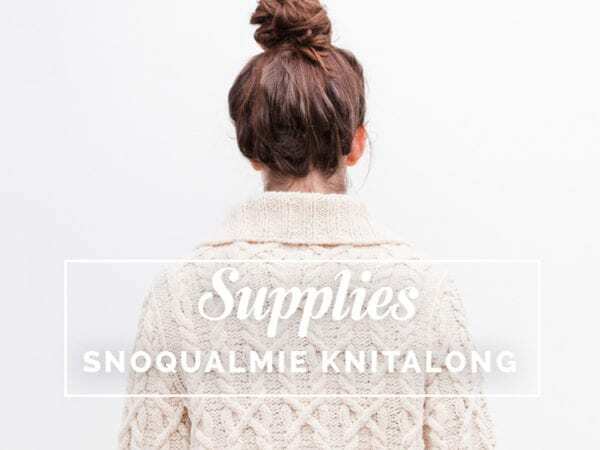 How’s your Snoqualmie coming along? 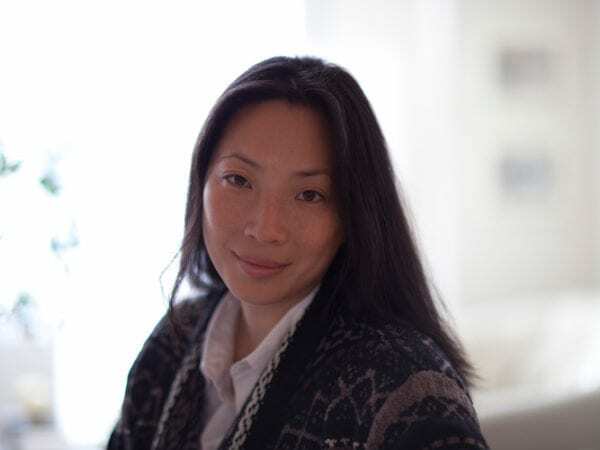 Have you run into any issues? Anything else you’d like me to cover about the construction so far?